The Hearth of the Home: From the materials used to create the surround to the mantle itself, the fireplace in your Great Room should be a focal point – a veritable work of art. It should reflect your personality and sense of style, as well as complement the rest of your home. From stacked stone with a rough-hewn timber mantle to a marble surround with intricate woodwork, you can go as casual or as formal as you wish to set the tone for the rest of the room. Raise the Roof: One component many builders use to make a Great Room feel GRAND is an open second story – opening the space up immeasurably. At Christmastime, just imagine how TALL your Christmas tree could be! If a two-story Great Room isn’t in the cards, there may still be a way to raise the ceilings to 10 feet for more of a sense of spaciousness. The World Outside: Windows are an important element of your Great Room. If you have a particularly beautiful and PRIVATE backyard, a wall of windows may serve to make the room seem more expansive – connecting it to the world outside. If that is not the case, the addition of just a few windows to let the light shine in might be a better way to go – helping to keep the focus inside the room itself. All the Trimmings: Woodwork can serve as the frame to the Great Room of your dreams. For a more rustic, cozy feel, you might elect to go with timber rafters. 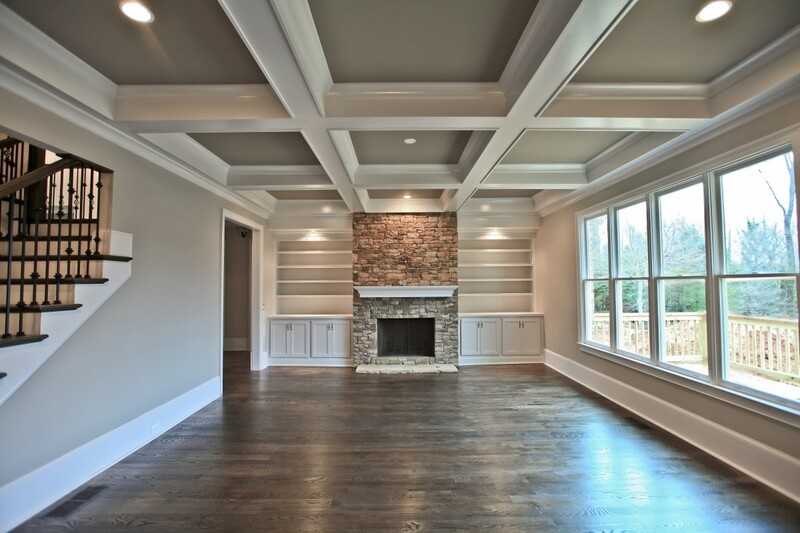 For a more traditional, formal feel, you might incorporate a coffered ceiling, crown molding and built-in bookcases. Go with the Flow: If you always dreamed of having one of those enormous overstuffed sectionals where you and the entire family can lounge around eating popcorn and watching a Christmas movie marathon, it’s important to communicate this to your builder. The layout of the room should be designed in such a way to accommodate your vision – from the placement of the sectional to the location of the TV. The Ground Beneath Your Feet: Choice of flooring can serve to enhance this space, as well. If you elect to go with hardwoods or tile, you’ll want to invest in throw rugs to soften the space and make it more inviting. The addition of carpet will make it more welcoming to bare feet, but be aware that spills in this popular space are a very real possibility – making the investment in stain-resistant carpet a wise one. A Little Light on the Subject: Lighting is an oft overlooked design element that – when wielded properly – can result in a stunning transformation of any space. If your Great Room doesn’t get a lot of natural light, you’ll want to pay attention to the placement of your lighting. For a truly dramatic effect, invest in one showstopper fixture in the center of the room. Color Me Happy: The choice of paint colors in this space can serve to open up the space further AND set the mood. You might want to keep it neutral and let your décor do the talking, or you may want to choose a paint and trim color that will enhance the ambiance. Gray is all the rage in home design. You might elect to paint the walls a pale gray and the trim a slightly darker gray. Gray exudes a sense of balance, formality and sophistication. Other emotions/sensations tied to color include: beige = calm, white = clean, black = edgy, brown = earthy and rustic, pink = innocent, red = passionate, yellow = happy, green = natural, blue = serene and inviting. The team at Atlanta-based Highlight Homes welcomes the opportunity to help you transform the look of your current family room, add a Great Room onto your existing home or design a custom home on your behalf that includes the Great Room of your dreams. Getting started is easy! Simply call us at 678-873-9234 or email us at info@highlighthomesga.com to schedule your no obligation consultation. You can also elect to complete our convenient online contact form. From all of us here at Highlight Homes, we wish you and yours a very Happy Holiday Season and all the very best in the New Year! Occasions Take Shape: If you like to host a large group for the holidays or more intimate affairs any time of the year, the shape of your dining room is a major factor. A larger, rectangular room to accommodate a long dining room table with room enough for up to 10 to 12 guests may be on one end of the spectrum while a square space to accommodate a round table for up to 6 to 8 guests is on the other. This is your stage, so decide what shape and size works best for you and your family. Table Setting: The dining room will serve as the backdrop to a treasure trove of occasions – from gatherings with neighbors to memorable family events to countless holiday celebrations. The décor of your dining room will set the tone. 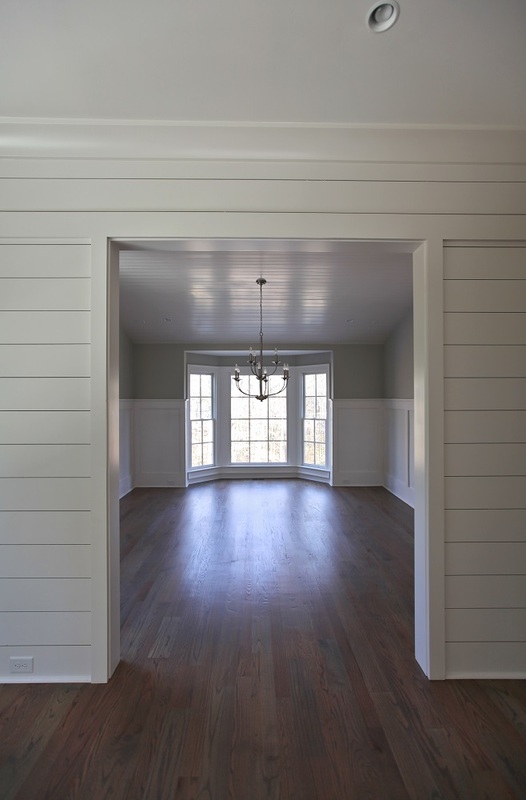 Your woodwork and lighting choices can add a sense of comfort or air of elegance. 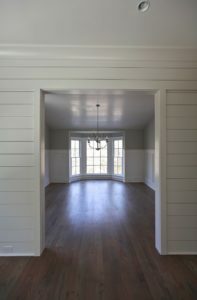 A stately chandelier and coffered ceiling paired with traditional chair rail, wainscoting and crown molding serve to make the room feel more formal while shiplap walls and industrial or farmhouse-themed lighting may make the space seem more casual and inviting. 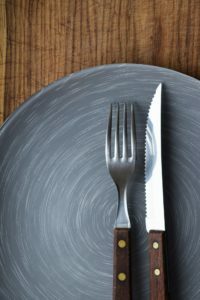 Go with the Flow: You could have the most beautiful dining room in the world, but the MEAL and the company who shares it will always be central to any occasion. Just as you would in any successful restaurant, to aid in making each meal a success, you want a seamless flow between your kitchen and the dining space. If entertaining is one of your favorite pastimes, you’ll want to place a major emphasis on flow with your architect or designer when creating your custom home or undergoing a renovation. You might want to consider the incorporation of a butler’s pantry between the kitchen and dining room to shorten the length of travel when refreshing drinks during the meal or for guests who demand seconds. Location, Location, Location: The placement of your dining room within the home is also key. If you crave privacy, you may want to place it towards the rear of the home, overlooking your private backyard. This placement will also prove most helpful if you are a grill master and need to have easy access to your outdoor living space. If you want to advertise to your neighbors what an AWESOME entertainer you are, you may want to place your dining room towards the front of the home – with a large picture or bay window to frame the scene inside. Whether an element of your custom home design or part of your luxury renovation, Highlight Homes welcomes the chance to help you realize the dining room you’ve always dreamed of having. Getting started is easy! Simply call us at 678-873-9234 or email us at info@highlighthomesga.com to schedule your no obligation consultation. You can also elect to complete our convenient online contact form. From all of us here at Highlight Homes, we wish you and yours a very Happy Thanksgiving and a wonderful holiday season!